The grandson of Jessi Colter and Waylon Jennings recently released an EP of duets with his daughter. Titled Sunny Days, Struggle Jennings, born Will Harness, and his 19-year-old daughter Brianna Harness released it on January 18. “Ace in the Hole,” one of the songs on the four-track project, features Struggle’s legendary grandmother, as well as his mom Jenni Eddy Jennings. Jenni is Jessi’s daughter from her first marriage to Duane Eddy. Although he is not blood related to Waylon Jennings, Struggle grew up as though he was. He even spent his summers growing up working on his Grandpa Waylon’s road crew. “I wrote this song about the women in my life who have been my strength through some tough times. Then I got the same women to sing it,” he said. 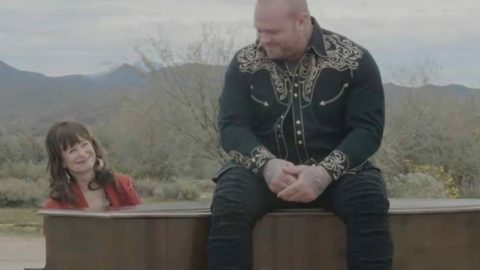 The musician just dropped the music video, which was filmed in Arizona, on Wednesday (Feb 6). All four generations got their chance to shine while singing solo, but our favorite part was when Struggle sat on top of Jessi’s piano and they finished out the song together. Colter shared a photo from filming the music video on her Facebook page. Watch the music video for “Ace In The Hole” below.